Nearly all equipment manufacturers need to identify their products with certain information related to product specifications and origins. Nameplates and dataplates serve this function. Clarion is fully capable of customizing nameplates and dataplates to meet your exact specifications. The example shown to the right is typical, though know that the entire design (including layout, field names, size and colors) can be modified to meet your requirements. White aluminum plates with either filled in data or blank natural aluminum fields where you can add in (stamp, engrave, etc.) your own variable data. Either type of aluminum plate can be ordered using our standard templates or fully custom designed to meet your needs. Polyester labels that have a write-able overlaminate that you can fill in. Polyester labels with a polyester or scratch-resistant Lexan® (polycarbonate) overlaminate with your data already printed underneath. You supply the information for us to digitally produce. 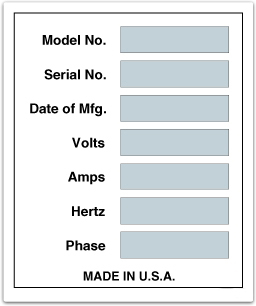 Each nameplate or dataplate can have unique data, using our serialization capabilities. 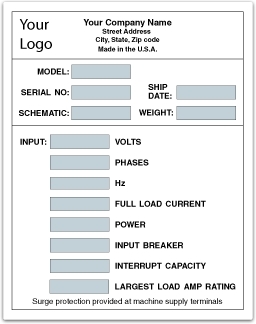 Do you have unique formatting or material needs for your equipment identification? We specialize in partnering on fast, easy and precise customization – for safety signs and labels that meet your needs and today’s best practices. Our customization specialists are ready to work together to develop your custom warnings. To get started, use our online custom quote request tool. 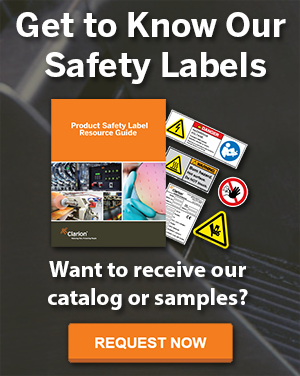 You can also contact us at (877) 748-0244 or compliance@clarionsafety.com.